When to Call the University Police- RIGHT AWAY! Any incident involving any weapon being displayed. Any incident where a person has been injured by the actions of another. Any incident where a threat to harm or kill someone was made. Any suicide attempt or mention of suicide. Any incident involving a hate crime. When you smell fire, a burning odor, or see smoke. IF IN DOUBT, call and let trained personnel decide! University Police officers cannot provide the best quality service without the cooperation of responsible faculty, staff and students. They expect YOU to call and tell them whenever you observe suspicious persons or actions. Some people fail to call the police simply because they are not aware that seemingly innocent activities might be suspicious. Others may notice suspicious activity and be hesitant to call. Still, others take it for granted that someone else has already called. Call the police immediately about all suspicious activity. Don't worry about bothering them because it is the duty of the police officers to investigate any and all possible threats to campus safety. Don't worry about being embarrassed if your suspicions prove unfounded. Think, instead, about what COULD have happened if you had not called! Campus Police are responsible for issuing a timely warning when a crime is reported to or brought to the attention of the Campus Police that there is a serious or on-going threat to the safety of members of the campus community. Information also comes from other law enforcement agencies. Every attempt will be made to distribute the warning promptly; however, the release is subject to the availability of accurate facts concerning the incident. RAVE is used to enable local government officials to record, send and track personalized messages to thousands of residents in minutes. RAVE user base has grown to include institutions of higher education, including multiple UW system schools. By registering, any message generated by the university for any reason will be sent via the method chosen by the registered user. Available choices of notification are email, text or call notification. Campus Police will prepare a warning whenever a report is received of a violent crime against a person or a substantial crime against property on campus that represents a serious or on-going threat to the safety of students, faculty, and staff. Warnings will be e-mailed as quickly as possible to faculty, staff, and students, and distributed throughout the campus, provided to campus media, and if appropriate, posted in off-campus areas frequented by students. A brief statement of the incident. The purpose of the emergency procedures outlined in this plan is to provide protection to the lives, property, and operations through the effective use of university, community, county, and state resources. This document has been developed to provide an organizational and procedural framework for the management of emergency situations through the coordination between the University and other government and emergency units. Additionally, it has been designed to provide a basic contingency manual for the administration of the University in order to plan for campus emergencies. The plan does not cover every conceivable situation; it does, however, supply the basic administrative guidelines necessary to cope with most campus emergencies. It is understood that the University of Wisconsin-La Crosse will make every effort to respond to individuals who are affected by a crisis or emergency with compassion and concern. This plan applies to all faculty, staff, employees, students and visitors. It encompasses all buildings and grounds owned and operated by the University. The development and administration of this Emergency Response and Preparedness Plan is the responsibility of the Chief of University Police. MINOR EMERGENCY: Any incident which does not seriously affect the overall functional capacity of the University, such as minor plumbing problems or an inoperative elevator. MAJOR EMERGENCY: Any incident which affects an entire building or buildings and which will disrupt the overall operations of the University. Examples are a building fire or chemical spill during which outside emergency services will probably be required, as well as major efforts from campus support services. Major policy considerations and decisions will usually be required from the University Administration during times of crises. The Central Emergency Command Post in the Police Services Office will be activated by the Chief of University Police or their designee. Regardless of the time of day, immediate contact should be made with those persons who are best able to provide the needed services in response to an emergency. In all life threatening emergencies dial 911. If you have additional information, follow up with a call to University Police at 608-789-9999. All other emergencies should be directed to University Police at 608-789-9999. University Police and Telephone Services staff will be responsible for contacting designated responders and administrative officials and initiating the specific guidelines in this plan. It is not the intent of this document to address off-campus emergencies. If a life-threatening emergency occurs while on University business, dial 911. If 911 is not available in the area, dial 0 for the local operator. Follow up with a call to University Police at 608-789-9999. Your personal safety is of utmost concern. Take appropriate precautions to assure your personal safety. The authority to declare a Campus State of Emergency rests with the Chancellor (or designee) upon recommendation of the Vice Chancellor for Administration and Finance with input from the Chief of University Police. When this declaration is made, access to the campus may be limited to registered students, faculty, staff, and employees at the discretion of the Chief of University Police. Those who cannot present proper identification showing their legitimate business on campus may be asked to leave the campus. Unauthorized persons remaining on campus may be subjected to arrest in accordance with Wisconsin State Statutes and UWS 18.06 of the Wisconsin Administrative Code. In case of emergency, all employees must follow the specific emergency procedure found in section XII of this plan. Emergencies that may be life threatening should be reported immediately to 911. Other emergencies should be reported to University Police, 789-9999. Your personal safety is of utmost concern. All employees are responsible for taking precautions to assure their safety by familiarizing themselves with this plan. Instructors are responsible for initiating emergency procedures during class. Understand and disseminate emergency procedures and information as outlined in this plan to building occupants and employees with the assistance of the building directors . Inform all building occupants under their direction of the emergency condition. Evaluate the impact of the emergency on their activity and take appropriate action. This may include ceasing operations and initiating emergency response. Assume responsibility for the overall direction of the Emergency Operations Plan. Work with the campus emergency staff and other resources in assessing the campus emergency and prepare the University's specific response. Activate the campus emergency command post in the University Police Department if necessary. Declare and terminate a campus state of emergency as outlined in this plan. Assure that notification and liaison activities are established with the University administration, local, county and state governmental agencies, campus emergency staff, and other resources as necessary. Assure the review and revision of the emergency operations program and emergency procedures as needed. Maintain a roster of campus emergency staff and emergency personnel including outside agencies. Assure that corrections of deficiencies reported by regular inspections of the emergency operations program are completed. Perform other related duties as may be directed by virtue of the campus emergency. In conjunction with the Environmental Health, Safety, and Risk Manager, prepare and submit a report to the Vice Chancellor for Administration and Finance appraising the final outcome of an emergency. The Vice Chancellor for Administration and Finance shall act as the Campus Emergency Director in the absence or incapacitation of the Chief of University Police. Act for the University Police as delegated during a campus emergency. Maintain a record of events and files of all reports and correspondence pertaining to the emergency operations program. Maintain the emergency operations program and emergency procedures. Assist the Chief of University Police in preparation of the final report to the Vice Chancellor for Administration and Finance after an emergency. Maintain an up-to-date roster of all campus emergency staff and emergency personnel including outside agencies. Oversee triage of emergency scene in collaboration with community resources. Support the first-aid and emergency care operations on campus. Assist with other emergency activities as needed. Any medical doctor from the Health Center shall act for the Medical Supervisor in that person's absence or incapacitation. If a medical doctor is not available a nurse practitioner or registered nurse shall act as the medical supervisor. Assure that the Central Heating Plant is protected, maintained, staffed, and that damaged utility services are secured or shut off. Maintain the campus fire alarm systems and emergency generators. Conduct damage assessment and emergency repairs as needed. Provide vehicles, supplies, and delivery support for the campus emergency staff and emergency personnel in cooperation with Chief of University Police. Provide support for the emergency operations of the Central Heating Plant. Provide equipment and operators to remove trees and other obstacles. Provide staff support to aid in the securing of damaged buildings. Provide equipment and supplies to emergency personnel. The Associate Director, Facilities Management shall act for the Director, Facilities Management in that person's absence or incapacitation. Serve as a reference point for changes, suggestions, and recommendations in the emergency operations program. Recommend changes in the program to the Chief of University Police. Revise the emergency operations plan as significant changes occur and review contents and make suggestions for changes to the Chief of University Police. Assist the Chief of University Police with developing the post-emergency report. Provide technical and safety assistance to reduce hazards prior to and during emergency or disaster conditions. Investigate and evaluate campus hazards in environmental health and safety. Initiate corrective action. Coordinate safety inspections for buildings and grounds using discrepancy reports to initiate corrective action. Coordinate submittal of liability claims, claims investigation and subrogation against culpable parties. The Vice Chancellor for Administration and Finance shall act for the Safety Officer in that person's absence or incapacitation. Activate the "PROCEDURES TO BE FOLLOWED IN THE EVENT OF LIFE THREATENING EMERGENCIES OR A DEATH OF A UNIVERSITY OF WISCONSIN-LA CROSSE STUDENT" policy. A copy of the policy may be acquired in the Student Life Office. (See Appendix 1) . Call upon the University Critical Incident Stress Management team when appropriate. Ensure that "Next Day Procedures and Responsibilities" (section II), of the procedure (Appendix 1) are completed. Ensure that "Follow-Up Procedures and Responsibilities" (section III) , of the procedures (Appendix 1) are completed. Determine if a separate, institutional memorial service is warranted in the event of a student death(s). Once the crisis has subsided, convene a meeting of all personnel involved in the response to debrief and critically review institution's response. Assist with emergency activities as requested by the Chief of University Police or designee. Coordinate and direct all dissemination of information relating to the incident to all media. Act as the link between the University and the public to ensure that all information is factual and provided in a timely manner. Make an assessment of the traumatic event and determine the appropriate intervention. If necessary, the Director, or in the Director's absence, the Assistant Director of Clinical Services and/or the on call person for the day will contact the Coordinator of the Gundersen/Lutheran Critical Incident Stress Debriefing team. The Director of Counseling and Testing will mobilize a Critical Incident Stress team and conduct stress debriefings and defusings as required. The UWL Human Resources department will be available to help make Employee Assistance Program (EAP) referrals after the emergency is managed. The central emergency command post will be established at Police Services (605 17th Street North) by the Chief of University Police, or designee, during a major emergency or disaster. The command post will serve as a focal point for key personnel and a central location for emergency equipment and operations. The Maintenance and Stores Building will be used as an alternative site in case the Police Services office is not available. In the event of an emergency that includes the loss of power to Police Services, command post operations will be via two-way radio on the University Police frequency. The operational duration per radio is 10 hours. Should the outage extend past this time frame, efforts will be made to secure a mobile generator to provide power for base station operation and other essential communication hardware. Batteries can be charged through the generator's power should the outage be extended. University Police and Telephone Services will work together to maintain an up to date listing of staff having university cell phones. Dependent on need, these staff may be asked to provide their phone for emergency telecommunications during a time of crisis where the telephone system is inoperable. 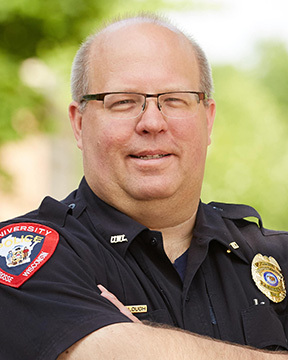 The Chief of University Police, or designee, will direct the dispatcher to contact the Director of University Relations and request he/she come to the campus to set up a Communications Center within Police Services to deal with the media. The Director of University Relations will request that all calls concerning the crisis be forwarded to the University Communications Center. The Director of University Relations, through discussions with the Chancellor, Vice Chancellor for Administration and Finance, Dean of Student Development, and Chief of University Police or their designee, will begin developing strategy for releasing information, proactively, to the media. If the crisis occurs after hours, the University Relations Director will contact appropriate staff members at home to secure special assistance. The number of persons contacted will depend upon the nature of the crisis. The Director of University Relations will assign responsibilities to staff members. The Director and his/her staff will assist University Police in keeping the media a safe distance from the event site. The Director of University Relations will determine whether a major press conference area needs to be made available. If major media are expected, parking will need to be arranged for uplink vehicles. The Director will coordinate this with the Chief of University Police or his/her designee. This section contains the recommended procedures to be followed during specific types of emergencies. The procedures should always be followed in sequence, unless conditions dictate otherwise. The County Local Emergency Planning Committee has developed a plan in accordance with Federal and State laws to help respond to an airborne release of hazardous substances. University Police will be notified in the event of an airborne release. The University Police Department will then notify University administration, directors, and other campus personnel. University Police will contact UWL Physical Plant Facilities Services to request that all ventilation systems components be shut down. If directed, evacuate the building site and move to a designated safe location. If not informed to evacuate, close all windows and doors to the outside. If the airborne release starts to bother you, hold a wet cloth or handkerchief over your nose and mouth. Minimize the use of elevators in buildings. These tend to "pump" outdoor air in and out of a building as they travel up and down. Tune to the emergency broadcast station on (on campus WLSU 88.9 FM) your radio or television for further information and guidance. The lead time of an airborne release incident could be from zero to thirty minutes. As a result, this short time may not allow for a safe evacuation. An evacuation under these conditions may expose the population to airborne hazardous substances; therefore, the recommendation is to shelter in place. Preferred areas for protective sheltering would be interior hallways, rooms without windows or exterior doors, enclosed stairways, and rooms on the side of the building away from where the hazard is approaching. Note: This procedures relates to both on and off campus airborne releases. If, during bitter cold weather, residences of the city of La Crosse suffer a power failure, the university will offer the use of Mitchell Hall, or Recreational Eagle Center building, as designated by the Chief of University Police. The campus police officer on duty, when notified, will open those buildings designated and contact the Chief of University Police, a custodial supervisor, and the La Crosse County Emergency Government coordinator. The La Crosse County Emergency Government, Red Cross, and the Salvation Army will supervise those people being housed at UW-La Crosse. The Chief of University Police will contact the building directors for those buildings being used for this event. The building directors will notify the department chairs so that, if needed, alternate plans be made for any affected classes. If you observe a suspicious object (including mail) or potential bomb on campus DO NOT HANDLE THE OBJECT! Clear the area and immediately call University Police at the designated emergency response number 608-789-9999. Exact location of bomb (building, floor, room, etc.). Kind of bomb, timing device, etc. Speech pattern, accent, distinguishing characteristics, etc. After hanging up, pick up and listen for dial tone and dial 157 for call trace. Immediately notify the University Police at the designated emergency response number, 608-789-9999. If the threat of an explosion is imminent, activate the fire alarm and evacuate the building. Evacuate the building by the nearest available exit. If persons with disabilities cannot safely evacuate the building, assist them to the nearest stairwell away from the bomb threat. Alert emergency personnel of their location. DO NOT RETURN TO AN EVACUATED BUILDING unless authorized by the University Police. Report any spill of hazardous chemicals immediately to UWL University Police at the designated emergency response number, 608-789-9999. University Police will call the UWL Environmental Health, Safety and Risk Manager (608-785-6800). Vacate the affected area at once and seal it off to prevent further contamination. If a building emergency exists, activate the fire alarm. Evacuate the building by the nearest available exit. If persons with disabilities cannot safely evacuate the building, assist them to the nearest stairwell away from spill site. Alert emergency personnel of their location. Once outside, move to an area that is at least 100 feet away from the affected building. Keep streets and walkways clear for emergency vehicles and crews. DO NOT RETURN TO AN EVACUATED BUILDING unless authorized by the Campus Environmental Health, Safety and Risk Manager, the Fire Department, or University Police. Keep calm. Resistance may only increase destruction of property and a threat of bodily harm. Do not confront demonstrators. Group is: rational, organized, violent, etc. When University Police arrive, provide them with an update. Follow their instructions. If INDOORS seek refuge in a doorway or under a desk or table. Stay away from glass, windows, shelves and heavy equipment. If OUTDOORS, move quickly away from buildings, utility poles and other structures. Caution : Always avoid power or utility lines as they may be energized. After the initial shock, evaluate the situation; and if emergency help is necessary, call University Police at the designated emergency response number. Report any injuries. Damage to facilities should be reported to Physical Plant Facilities Services. If there is a strong odor of natural gas, please relay this information to University Police and evacuate the building. If you are trapped in an elevator, pick up the emergency phone to notify University Police. The telephone will automatically ring at the UWL dispatch console. If the phone is inoperable, turn on the emergency alarm which will signal for help. DO NOT ATTEMPT TO EXIT A STALLED ELEVATOR UNLESS TOLD TO DO SO BY EMERGENCY RESCUE STAFF. If a person is stranded in an elevator, DO NOT ATTEMPT TO FORCE OPEN THE ELEVATOR DOORS. BE PATIENT. A person stranded in an elevator needs to be reassured that his/her alarm has been noticed and help is coming. Keep in contact until help arrives. If you find an inoperative elevator without occupants, notify University Police and Physical Plant/Facilities Services. Immediately take cover under tables, desks, or other objects which will give protection against falling glass and debris. After the initial effects of the explosion have subsided, notify the La Crosse Fire Department at the designated emergency response number (911). Give your name and describe the location and nature of the emergency. Notify University Police at the designated emergency response number (608-789-9999). Evacuate the building through the nearest available exit. If persons with disabilities cannot safely evacuate the building, assist them to the nearest stairwell away from damaged area. Alert emergency personnel of their location. Once outside, move to a clear area that is at least 100 feet away from the affected building. Keep streets and walkways clear for emergency vehicles and crews. DO NOT RETURN TO AN EVACUATED BUILDING unless authorized by a La Crosse Fire Official or University Police. In case of fire, activate the nearest fire alarm. Take appropriate precautions to assure your personal safety. If a fire is in a room, and all people have exited the room, close the door to the room. When you are in a safe area, away from the fire, call the La Crosse Fire Department at the designated emergency response number (911). Give your name and the exact location of the fire (building, floor, room, etc.). Be sure to stay on the phone until released by the emergency operator. If you have additional information, follow-up with a call to University Police at the designated emergency response number (608-789-9999). Evacuate the building through the nearest un-obstructed exit. If persons with disabilities cannot safely evacuate the building, assist them to the nearest un-obstructed stairwell. Alert emergency personnel of their location. Always evacuate a building when the alarm is ringing. DO NOT RETURN TO OR ENTER AN EVACUATED BUILDING unless authorized by a City of La Crosse Fire Department official. UWL's inclement weather plan is invoked in the most serious times when conditions make travel to and from campus dangerously imprudent or other events cause serious safety concerns. When inclement weather (dangerous temperatures, snow, ice, wind or rain) occurs, University Police will confer with the Provost/Vice Chancellor prior to 5:45 a.m. for day classes and 1:45 p.m. for evening classes and events to determine if classes and events are cancelled. If the Provost/Vice Chancellor is unavailable, the next designee, the Vice Chancellor for Administration and Finance will be contacted. Based on changing conditions, the plan can be implemented at any time. A determination of closure means all university classes and events are cancelled. It is State policy to keep state offices open even when severe weather exists. University Police notifies University Communications which, in turn, will notify news media. Hourly classified employees who do not report to work, report late, or leave work before the end of the work day because of weather conditions will be allowed to make up lost time during the remainder of the work week, as much time as is beneficial to the work unit. Make up time shall be at the regular rate of pay. Hourly employees may also take leave without pay, vacation, personal holiday, or compensatory time to cover absence. If specific contract language differs from this policy, the contract prevails. Salaried classified and unclassified employees may use available annual leave (vacation), compensatory time, available holidays, or leave without pay to cover inclement weather absences. An employee and the employee's supervisor may agree that the employee can account for the time of the absence in another manner consistent with the professional nature of the employee's work assignment. When the Governor closes State government offices this DOES NOT mean the UW System or UW-La Crosse. The UWL Student Health Center will most likely be involved in the assessment and management of an infectious disease outbreak. If not, contact the Director of the Student Health Center, the Medical Supervisor or the Head Nurse at the number above. The Health Center personnel will contact Keith Butler, Emergency Government Coordinator of La Crosse County, 608-789-4811 and the Dean of Students, 608-785-8150. Notify the La Crosse County Health Department at 608-785-9872. Wisconsin Statute Chapter 143 and Administrative Rule Chapter HSS 145 require reporting of communicable diseases using the Acute and Communicable Disease Report. The Student Health Center staff will complete this report. In cooperation with UWL Administration, County and State health officials, the Health Center will manage infectious outbreaks according to CDC, County, State and ACHA guidelines. Refer to Appendix 6 for SARS guidelines. If the situation requires emergency medical care, follow emergency procedures by calling 911 to provide immediate health care. Notify the designated emergency response number (911) and University Police (608-789-9999). A University Police officer will proceed to the scene immediately and meet the La Crosse Emergency Responders. The scene will be secured by a University Police officer. Emergency care will be provided as needed pending Emergency Medical Service (E.M.S.) arrival. The officer will start with a preliminary investigation, and inform the Chief of University Police. The University Police will turn the scene over to La Crosse Police Department or La Crosse County Sheriff's Department, if indicated. In the event of a death of a student, the Chief of University Police (or if unavailable, the officer on duty) will contact the Student Life Office and proceed to the scene. The UWL Student Life Response Plan, available in the Student Life Office, will be followed under the direction of the Assistant Dean of Student Life. ( See Appendix 1 ). In the event of a death of a staff member, the Chief of University Police will contact the Provost/Vice Chancellor's Office and proceed to the scene. If a serious injury or illness occurs on campus, immediately call 911 for an ambulance. Give your name, describe the nature and severity of the medical problem, and the campus location of the victim. Do not hang up until released by the emergency operator. Officers will respond with medical supplies, automated defibrillator (AED), and oxygen. If the individual is conscious and oriented, they have the right and responsibility to determine his/her own health care needs and the response to those needs. Under such circumstances, University staff should refrain from recommending specific health care vendors. In circumstances involving a person who is unconscious and/or not oriented, call 911. All police officers are trained in First Response Care, C.P.R., and AED. Keep the victim still, calm, and comfortable until help arrives. Do not move the victim. In case of a minor injury or illness, students may go to the Student Health Center or have a trained person provide appropriate first aid. First-Aid and CPR training is available through various resources within the community. Individuals whose position description does not require them to provide first aid are acting as good Samaritans. If you smell natural gas and suspect a gas leak, evacuate area and activate fire alarm OUTSIDE the area of the leak. DO NOT SWITCH ON LIGHTS OR ANY ELECTRICAL EQUIPMENT. Evacuate the building by the nearest exit. While evacuating, notify other building occupants to do so as well. If persons with disabilities cannot safely evacuate the building, assist them to the nearest stairwell away from the emergency area. Alert emergency personnel of their location. Notify University Police at the designated emergency response number. State the location and extent of the gas leak. Once outside, move away from the building at least 100 feet. Keep walkways clear for emergency crews. DO NOT RETURN TO AN EVACUATED BUILDING unless authorized by University Police. For minor leaks during normal business hours (6:00 a.m. to 4:30 p.m., Monday - Friday) contact the Physical Plant Office at 608-785-8585. If no response or after hours, contact University Police at 608-789-9999. Do not argue with the individual. Try to determine and accept the individual's point of view. Do not confront/detain the individual if he/she is violent/combative. If another person is available and able to leave the area, have them meet University Police at the entrance to the building and provide up-to-date information. Notify the Director of the UWL Counseling and Testing Center. In case of an emergency call University Police at the emergency number and the Radiation Safety Office at 608-785-6458. If a skin wound occurs, thoroughly wash it with running water, allow some bleeding and then bandage. The Radiation Safety Officer or other personnel trained in use of radiation monitors will evaluate the injured person(s) for radioactive contamination. If any clothing items are contaminated with radioactive materials, remove the clothes and place them in designated collection containers or plastic bags. These items will be cleaned or disposed. THE CONTAMINATED CLOTHES AND PERSONS MUST NOT LEAVE the laboratory or established decontamination zone until the Radiation Safety Officer checks them. A decontamination zone or emergency response services should not provide patient care in a contaminated area. Mark any contaminated surface areas as demonstrated by your instructor/supervisor. Clean up the spill following previously conveyed directions of the Radiation Safety Officer or under the direction of the Radiation Safety Officer. Thoroughly wash your hands and other exposed body areas until the radiation monitor indicates the absence of contamination. Prevent access into the spill area until authorized by the Radiation Safety Officer. Personnel without radiation badges or other personal radiation dosimeter must not enter the spill area. Immediately send a University Police officer to the scene. The officer will assess the situation and determine if the incident involved force or attempted use of force. If force was involved, the officer will contact a police supervisor promptly. A decision regarding potential mutual aid will be made. Attempt to obtain written statements from the victim including non-consent to the offense, if applicable. The interviews should be conducted outside the suspect's presence. Do not ask the victim if they want to press charges. Attempt to obtain a signed medical release from the victim(s). Prepare an area where the photographs can be taken if needed. The victim should be encouraged to contact New Horizons and Counseling & Testing for support and intervention. Attempt to obtain statements from the witnesses. Complete a follow-up investigation including suspect interviews. The information is shared only with those offices with a need to know. Depending on the residence of the student, the type of emergency or the follow-up required, the list of offices with a need to know will vary from one situation to the next. Care must be taken to protect the confidentiality of the individual/s involved as much as possible throughout the process. The officer will notify the Director of the Counseling and Testing Center. The Chief of University Police will monitor sexual assault related reports and inform the District Attorney. University Police personnel will work with the District Attorney and Victim's Witness Unit when additional information or evidence is requested. The Chief of University Police will be responsible for on-campus notifications and distribution of reports to university resources and departments as appropriate. A tornado watch/severe weather watch means tornadoes are likely to develop. Employees are expected to be alert to changing weather situations and be prepared to take action if upgraded to a warning. A tornado warning means a tornado has been spotted in the immediate area. Employees/students are expected to take the following action. Avoid auditoriums, gymnasiums, and other large rooms with free-span roofs. If persons with disabilities cannot safely move to the lowest level, assist them to an interior hallway away from windows and areas with a large expanse of glass. This procedure addresses actions to be taken after notification by the city of La Crosse Water Utility that harmful contaminants have been identified in the water supply. La Crosse Water Utility is required by state and federal law to inform the campus of a violation of the maximum contaminant level for certain contaminants in water. Do not consume campus water. If bacterial contaminants are present, all water used for drinking, cooking, or washing of eating utensils should be boiled at a rolling boil for at least five (5) minutes. Ice and any beverages prepared with contaminated water should be discarded. Continue the no use and/or water boil order until the city of La Crosse Water Utility or University Police notifies you that the city has rescinded the warning or alert. Everyone on campus will be expected to assist in providing a safe environment by being alert to suspicious behavior and promptly reporting the situation to University Police at the designated emergency response number. Assist the officer(s) when they arrive by providing additional information upon request. Go to a safe place and notify University Police. Explain to the officer everything you observed, including telling the officer if you did touch or move anything. Follow the officer's instructions. Be observant! The more information you can provide, the better chance the criminal will be apprehended. Remember: Whatever you decide to do, you must be prepared both mentally and physically. Your safety is the most important thing to remember during any attack. As soon as possible get to a safe place and notify University Police at the Designated Emergency Response Number. Advise officers of the nature of the incident, location, if medical assistance is needed, and a description of the person(s) involved. Meet with the officer. Follow the officer's instructions. In case of medical emergencies and when emergency transport is necessary, a private ambulance service will provide the transportation. Emergency transport is requested through the 911 Emergency dispatch center. The UWL patrol vehicle may be used for non-emergency medical cases only. The patrol vehicle can be contacted by calling the designated emergency response number for University Police (608-789-9999). Generally, it is advised that individual faculty, staff or students not take responsibility for transporting a person involved with any health emergency. In the case of protective custody or emergency detention where a restraint is necessary, University Police will be involved directly with transportation. Every individual must accept personal responsibility for getting out of a building during an emergency. Even though emergency personnel are usually available to assist with evacuation, this may not always be the case. Alternative plans and arrangements made in advance of an emergency will increase the likelihood that individuals will be able to exit a building safely in the event of an emergency. This is even more critical to the safety of those individuals with mobility impairments because the use of elevators during emergencies is dangerous and should be avoided. Thus, individuals will need to use alternative methods of leaving a building. Because of constantly changing populations and building occupancy patterns, it is not possible for the University to make reliable arrangements for the evacuation of specific individuals from the many buildings they may occupy in the course of a week. In the absence of this ability, the following suggestions are advised for individuals to increase the chances of their safe evacuation from a building in an emergency situation. Recommendations for persons with disabilities or persons who provide assistance to persons with disabilities are included in the following list. Contact in advance the Disability Resource Services Office to discuss building evacuation procedures for individuals with disabilities. Identify in advance and be familiar with at least two exit routes from every area and building you occupy. An emergency exit route should not include an elevator. Identify in advance possible volunteers, such as classmates, faculty or fellow workers who are willing and able to assist you to evacuate. Make specific arrangements for their assistance. If you are unable to exit a building, contact University Police or civil authorities or arrange others to inform University Police or civil authorities with your location. If you use a wheelchair, be prepared to explain how and where persons should support you. Practice instructions beforehand. If you have difficulty being understood, develop a card containing all appropriate instructions and carry it with you. Carry a loud whistle or similar device you can operate for use in the event you become trapped. Individuals who need to work in isolated areas after normal building occupancy hours should determine telephone availability. If a telephone is not available, they should contact University Police in advance and provide their location and occupancy times. Updated building floor plan maps will be posted on each floor within all campus buildings. The maps provide information on evacuation routes. Upon notification of a campus state of emergency, University Police and/or the UWL dispatch operator shall start the notifications and the completion of the Emergency Response Checklist . Each campus emergency will present hazards and situations unique to that emergency. It will be imperative that University Police notify the proper personnel in a timely manner. Once the Crisis Team is notified, they will have the flexibility to respond to the incident as they deem proper for the situation at hand. The Emergency Phone Numbers provides a complete listing of individuals and/or agencies that can respond to a particular emergency. It will also be the responsibility of University Police to ensure the appropriate response (internal or external) for clean-up and decontamination when there is a spill of blood or other potentially infectious materials from an incident. The University Police will work with other campus departments and offices to ensure an evaluation of any significant crisis response is conducted after the incident. Recommendations for response improvements and other corrective action will be forwarded to an Emergency Planning standing committee to be reviewed for input into the campus Emergency Response and Preparedness Plan. This form is to be filled out upon notification and response of an emergency on or involving the campus area. It shall be the responsibility of the senior campus police officer on duty to ensure that this form is filled out accurately even though the switchboard operator/dispatcher will, in all probability, be the person initially completing the form.